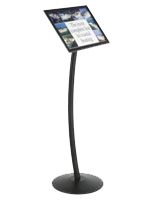 This sign stand is an example of elegance and practicality. At just under four feet tall, this poster display is the perfect height to catch the attention of passersby. 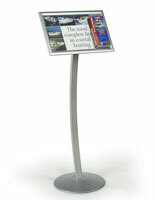 This sign stand, also called a menu holder or poster frame, is omnipresent in retail stores, hotel lobbies and restaurants. 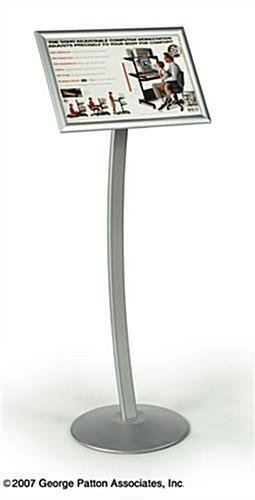 Each fixture has an angled face to facilitate the viewing of the signage. 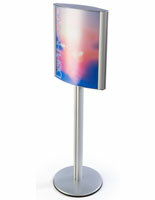 This sign stand provides the perfect showcase for any graphic print. Restaurants and hotel lounges often use this poster display to greet guests with welcoming signage. 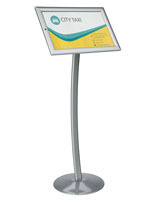 This sign stand, also known as a graphic display, has a snap open frame for easy change-out graphics. The frame's four sides lift up to allow the print to be replaced. 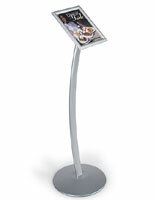 This sign stand has a satin aluminum finish and a non-glare clear PVC lens cover to protect your print. 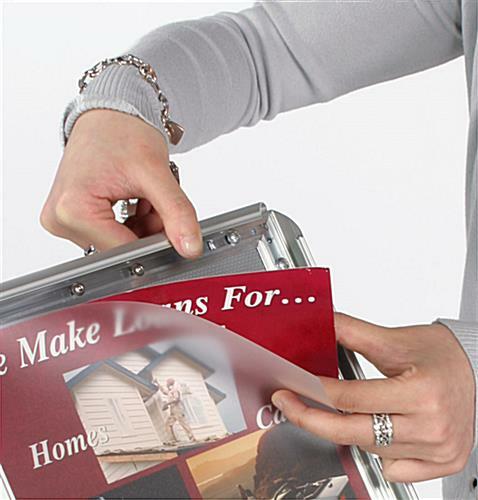 The lens keeps signage free of debris and dust. 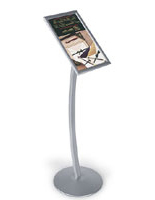 This floor standing holder, sign stand has a beautiful curved pole mounted on a rounded base. The base is weighted, which helps to keep the unit upright, even when tipped or bumped. 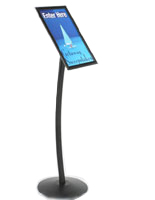 This sign stand ships unassembled, which helps to keep shipping cost at a minimum. One person can assemble this unit in less than ten minutes. 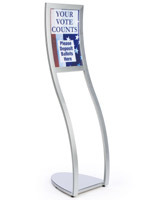 Buy this sign stand for your lobby or entranceway today! We are enjoying the ease of changing out signage and the clean lines of this display. I will admit it was a bit awkward for just me to attach the base to the stand. It can be done. They went together quickly and the base has a good weight to it to keep it from blowing over. Changing out signs is a snap! Thanks for taking the time to share your experience with us, Sandi! We're glad that you found our menu sign to be attractive and easy-to-use, especially with the snap open frame! We appreciate your feedback, and we hope you'll continue to turn to Displays2go for your business's display needs. I really am pleased with this stand. My only complaint is that it was a bit hard to get the screws in straight due to the curved post. But, I got it worked out and it works great. Quality of this item very impress, the item them sell make think loog more elegant. Thank you for the feedback, Chan!